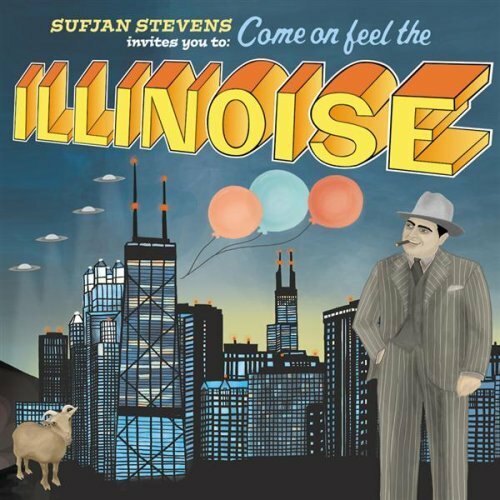 After moving to Chicago with the wife this summer, I couldn't think of a better album to review than Sufjan Stevens' 2005 release, Illinoise. This album is all about, and inspired by, the Land of Lincoln. "The Black Hawk War, or, How to Demolish an Entire Civilization and Still Feel Good About Yourself in the Morning, or, We Apologize for the Inconvenience but You're Going to Have to Leave Now, or, I Have Fought the Big Knives and Will Continue to Fight Them Until They Are Off Our Lands!" See, I wasn't lying! The song (which is barely over two minutes long) ends before the title can finish scrolling across the iPod screen. Two of my favorite tracks from Illinoise have respectably shorter titles. The first song has become my soundtrack for our move to Chicago, and is appropriately titled, "Chicago". Just thinking about the song reminds me of approaching the skyline of Chicago with all our belongings in the U-Haul. Whenever I hear the refrain, "You've come to take us. All things go, all things go" I remember the excitement and nervousness of moving here, and how I am lucky to find myself in such an amazing place, with an amazing person by my side. The other track, "Prairie Fire That Wanders About", isn't as personal, but still evokes a whimsical and surreal sensation. It's one of the shorter tracks, but there's something so magical about it that you hardly realize it's already ended. For those who don't know, Sufjan Stevens is part composer, part musician, part storyteller, part genius. The fact that he utilizes so many instruments in his songs is probably the most impressive thing. He is credited on this album for playing TWENTY different instruments. The amount of layers in each song is jaw-dropping with choirs, horns, and strings all joining together to paint a picture. It's not until I moved to Chicago and had a chance to drive through the state that I realized how accurately Stevens captures the feeling of Illinois. The beautiful prarie land, the golden fields, the quietness, the small farms. They're all there in his songs. Originally, Sufjan went on the record saying he was going to compose an album for each of the 50 states. Six years later, he's only made it through Michicgan and Illinois. In a 2009 Paste interview, Stevens looks back at the project he started saying, "The whole premise was such a big joke, and I think maybe I took it too seriously. I started to feel like I was becoming a cliche of myself." He also mentions the creative strain that composing The BQE, his instrumental tribute to New York's Brooklyn-Queens Expressway, put on him. Thankfully he didn't let it get him too down...in the years it took him to compose The BQE, he aslo released two EP's and a Christams album. Age of Adz, his latest work and considered by most as his big return, debuted just last week. Though releasing fifty full-length albums is a feat no man (or woman) could accomplish in a reasonable amount of time, I still can't help wishing he'd keep on going, or at least made it to Boston and my home state of Massachusetts!